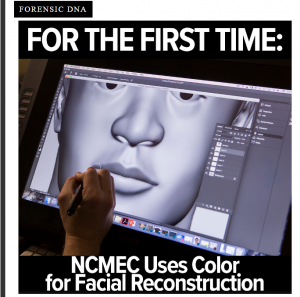 The NCMEC Forensic Imaging Unit has assisted in the reconstruction of hundreds of faces, but a unique partnership with Parabon NanoLabs has launched reconstructions into a new era. Read how phenotypes were developed on a John Doe that was found over 30 years ago that provided Forensic Artists the ability to apply color to a facial reconstruction for the very first time. The Forensic Imaging Unit is available to provide facial reconstructions and age progressions for unidentified or missing children nationwide. Read more here.